With so many options in the market, one can go mad before settling on any particular appliance. When it comes to laundry, you may want to avoid having to buy a washer and a dryer separately. That is why today I am going to save you the headache, and help you identify the best w﻿asher dryer combo 2019. You see, I am a kind of a perfectionist when we come to doing laundry. And I had just shifted to a new apartment, just for a change. Change is good, right? This meant one thing: I had to dispose of my cherished Samsung washing machine. And my cool LG clothes dryer because they couldn’t fit in the new apartment. My girl was of the idea that I buy a separate dryer and then a washer. But I’m not a fan of stacking things on others… And that’s how I decided to explore all-in-one washers. What’s the difference between washer dryer combos and other washer-dryer setups? Who are combo washer dryers for? Is an all in one washer dryer energy efficient? (Editor's Choice) 14 4.3 cu. Ft.
2. Splendide WD2100XC 10 15 lbs. 3. Dometic WDCVLB2 10 15 lbs. 4. Kenmore Smart 81983 n/p 9.0 cu. Ft.
5. Kenmore Elite 41002 14 4.5 cu. Ft.
Today, I will take you through detailed reviews of the top 5 best washer dryer combos, as well as an elaborate buying guide. Users looking for a washer/dryer combination that can fit under the kitchen counter or even a closet, and which is an effective laundry champion may also find the LG WM3997HWA ideal. With a capacity of 4.3 cubic feet, it is just slightly smaller than the Kenmore Elite 41002. However, it matches the 1300 rpm spin speeds guaranteeing not only immaculate clothes but also reduced waiting time. The machine also has a plethora of convenience and results-improving features. For example, the turbo wash technology helps cut down waiting time by about 30 minutes. Then, the TrueBalance anti-vibration system minimizes the racket coming from the tub during cycles. It also has the interactive control panel (on LED Display) that makes operating the combo a breeze. Coupled with steam technology, all these features enable the washer-dryer combo to powerfully penetrate fabrics and eliminate irritating dirt, bad odors, and wrinkles. Whether it’s your favorite shirt, yoga pants or the school uniform, the LG WM3997HWA can handle them all. This is thanks to the revolutionary 6-Motion Technology. It delivers 6 different washing motions thus shielding gentle clothes while ensuring they come out squeaky clean. Because of its versatility and efficiency, this can be the ultimate model for apartments, vacation homes, and businesses where space is at a premium. The LG WM3997HWA ventless 4.3 cubic feet combo can access the innermost parts of your fabrics. Therefore, it delivers one of the best cleaning performances. The combo has an advanced technology that shields your costumes from scorching while undergoing cleaning. It’s easier to maintain in tip-top condition because of the added self-sterilizing mechanism that regularly disinfects the tub. It produces very little noise when running even when working on piles of towels, sweatshirts, or a huge mountain of jeans. This is thanks to the anti-vibration system. Because of its wide array of sophisticated cleaning and drying features, it needs a bit of learning before you can be able to maximize on its powers fully. “A brilliant, efficient laundry mate” is how we can simply describe the fast-moving LG WM3997HWA ventless washer dryer combo. It’s also one of the most advanced combos technologically. The last combo washer/dryer to win my heart is the Splendide WD2100XC Vented Combo Washer/Dryer. Rated as one of the quietest, most resilient, and most convenient set, this unit relies on the spacious drum and powerful motor to wash massive loads of garments while saving space and energy. It measures 33-1/8″ x 23-1/2″ x 22-5” and is lighter. So, you can carry and use it virtually everywhere including in your lovely condo or loft. The Splendide WD2100XC delivers 10 washing cycles and can work on a 15 lbs. load in one run. This makes it a very able cleaning assistant whatever the pending laundry task is. Add the ultra-fast 1200 rpm high spinning speed, a durable brushless motor and additional stabilizers and you can see that it was designed with top-performance and convenience in mind. And true to its form, it cleans thoroughly. At least with the recommended load, while also taking care of your clothes to ensure they all come out unscathed. The most powerful player in cleaning is the drum, which rotates in either direction. So, it reduces fabric wrinkling while improving the washing and drying results. The easy-to-use controls also help make the whole process easier by allowing you to set the optimal temperature settings depending on the type of fabric in the machine. It also clear that this is a durable appliance as evidenced by the use of heavy-duty springs, shock absorbers, and the stainless steel drum. Maintenance isn’t that involving as the filter self-cleans and removes lint automatically. When running, the super-silent technology greatly reduces the usual noises in such models. This makes the Splendide WD2100XC vented combo one of the most silent units in the entire selection. This combo uses a host of heavy-duty components including a stainless steel drum making it a truly hardy unit. Also, it automatically controls water levels. Being a vented washer/dryer combination, this unit uses more energy than its ventless counterparts. Unless you become smart when doing laundry, you will often be faced by huge electricity bill. Efficiency and convenience are precious in any washer/dryer combo – and this has them in plenty. Plus, its super-silent technology makes it a popular choice in small homes. This compact washer-dryer combo flaunts a healthy mix of features that users need most in modern day laundry combos. The Dometic WDCVLB2 will conveniently wash and dry a whole load of your laundry in one swoop. It can hold a 6.8kg (15 lb.) load making it ideal for a couple or a family of 2-4 as compared to the family-moriented LG WM3997HWA and Kenmore Elite 41002. However, despite its reduced capacity, it beats its competition handsomely in several other aspects. For instance, this washer-dryer combo is one of the biggest energy and water savers and is thus easy on your pocket. Not only does it use 20% less water if set against its rivals, but it also provides drying and timer options which you can use to set/reduce the required temperature when cleaning. You can also set the machine to power on or off after a certain time. This means that even if you are the type that forgets easily, the unit will halt at the set time. So, you end up saving on unnecessary energy usage. The easy to use drainage helps to drain all the lingering water which can potentially damage your unit. This prolongs the life of the machine in addition to helping maintain it in mint condition. Another feature that helps in maintenance is the load balancing system which ensures that the loaded clothing doesn’t tilt towards one side – another occurrence which could eventually jam the unit. In terms of performance, the combo will do an impeccable cleaning job with the 10 available wash cycles. The cycles are enhanced with additional rinsing & spin cycles for the best results. Overall, this money-saving combo could also turn out to be a reliable laundry partner. The self-cleaning cycle helps in removing residue from inside the essential parts of the machine. Therefore, it remains in sparkling form and helps reduce maintenance cost. 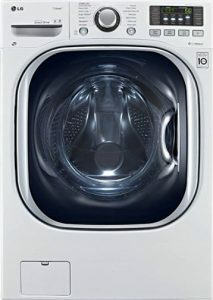 Its LED Display (with a cycle status indicator) helps you protect your clothes by allowing you to set the machine to run at a safe heat setting. As with other elite combos, the unit works from just about any water connection and doesn’t require any special water-supply valves. It senses the inserted load automatically and adjusts its water levels (and temperature) according to the volume of your wash load. This model doesn’t have a vibration control feature. So, it can make audible noises especially when being run in a squeezed space. Deceptively small but mighty, the Dometic WDCVLB2 ventless washer dryer combo is a remarkable laundry expert. And by using 20% less water, it’s a sure money-saver! Innovation and technology are still evolving in the washer-dryer combos space, but the Kenmore Smart 81983 seems to be already light years ahead of the competition. And while it has a lot going for it, to us, the app is the biggest news. You see with it, you are able to control the washer-dryer from anywhere – whether you are in-house or out running errands using your phone or Alexa! Conveniently, through voice commands on the app, you are alerted when a cycle is complete. You can also stop and start the dryer, customize the drying cycle in addition to checking the diagnostics. For people in condos and apartments, the Kenmore Smart 81983 comes optimized to deliver an advanced performance with an impressive range of advanced laundry innovations. Your favorite blouse should come out ready to wear and smelling fresh thanks to the super-fast Express Dry Cycle. In addition, the Sanitize cycle ensures that all germs and bacteria are killed. Moreover, the Accela Steam-based technology helps reduce wrinkles and odors. It’s also a unit you can trust with all your fabrics from the delicates to bedding. The numerous touch-button controls help you to easily choose the best treatment from the 14 available different drying cycles. This washer-dryer combo comes with a big capacity (0 cubic feet). It can, therefore, take on huge loads of towels, bedding, work uniforms and more. The Kenmore Smart 81983 combo not only produces a better cleaning performance but also help reduce wrinkles, germs, and odors. The installed overdrying sensor ensures that your delicates and sweaters are not damaged during drying. It stops the drying cycle as soon as it senses that the unit is overheating. Its easy-to-use touch control buttons help you set the optimal settings for your fabric, making your laundry days a joy. If you’re looking for an easy-to-use washer-dryer combo, this is it, thanks to the smart app. You will be easily controlling everything from the phone or Alexa. With a 4.5 cubic feet capacity enough to wash and dry as much as an 8 lb. load, the Kenmore Elite 41002 4.5 cu. Ft washer-dryer is a true family laundry master. The company has surely done a clean job here going out of the way to apply high-tech cleaning and drying technologies to deliver a skillful machine. Chief among these is the unique accela wash technology which uses high-pressure dual-spray nozzles to spray concentrated washing detergent directly to the loaded clothes. Also, the active rinse sprays the finest water particles wholesomely through costumes at high spin speeds. The end result is a full load of sparkling clean garments in a record 29 minutes! Also noticeable is its spin-dry speed of 1300 rpm (maximum), which is one of the highest. On the other hand, the dryer is remarkable because it helps dry fabrics quickly. This means that the whole cleaning and drying cycle is done within a remarkable 3 hours. In comparison, some units take even 5 hours to get the job done. To add to this excellent design, the machine gives you vast customization settings to help you get the best out of the unit. These include Cold Clean, which primarily uses cold water to clean fabrics as effectively as hot water. So, you end up saving on energy and, of course, money. By the same token, if you are the type which likes a truly personalized clean, you’ll be happy with the allergen cycle/setting. Steam power is harnessed to exterminate over 95% of all typical household allergens even from your most delicate fabrics. It’s one of the washer-dryer combos with the highest load capacity, cleaning a complete family load in minimal time. The steam treat technology means you are still able to remove common stains even without treating them prior to washing. Thanks to the cold clean feature, the machine helps you save energy and money by efficiently cleaning clothes using cold water. At 29.75 X 27.0 X 38.69-inches (LxWxH), this is one of the smallest and highly portable units out there. The combo may occasionally overheat and when it happens, your clothes could come out with wrinkles. The Kenmore Elite 41002 washer-dryer knows its job. 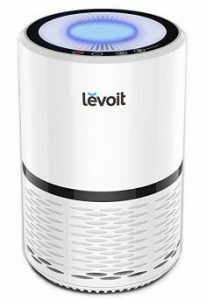 Its 4.5 cubic feet capacity, steam treat technology, and the cold clean feature combine to make it a powerful family laundry master. Simply, a washer dryer combo is a multi-functional laundry equipment that both washes and dries your clothes at a go. Essentially, it’s two laundry machines in one, whereby one is a washer and the other a dryer. A darling of apartment city inhabitants (apartment dwellers), a washer dryer combo brings together a front-loading clothes washer and a condenser fabric dryer. The 2 are installed in one tub/cabinet and are roughly the same size as compact washing machines while they don’t necessarily need an external vent. And you shouldn’t under-rate them. 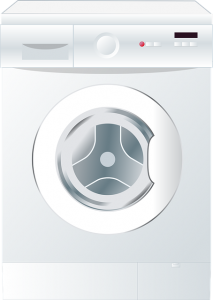 An all-in-one washer can comfortably handle various types of fabric and garments including sheets, clothes, and towels. In addition, washer dryer combos have all the essential functions. I’m talking about customizable cycle controls, temperature controls, and ventless systems. For people who live in compact spaces, a washer-dryer combo is a godsend. They occupy very minimal space making them a top choice for small homes, city apartments, and condos. In fact, because they’re also shorter, you can just squeeze it into one corner, under your kitchen counter or even in a closet and start working on your laundry. But for a few cases, it’s generally cheaper to buy a combined washer-dryer compared to investing in a standalone washer and a separate dryer. Likewise, some are energy-star certified and rated as efficient water consumers. So, you may end up spending less on your utility bills. A combined washer dryer is also built to be portable. Some have wheels so you can easily move them in or out of different cabinets, rooms or closets. In like manner, they neither need dedicated electrical (or gas) outlets nor vents (unless for the rare vented types). Therefore, relocating the machine is pretty easy. Additionally, these combination machines allow garments to be cleaned and dried at a go, saving time and effort. Also, they will still do a thorough job since they possess most of the popular features of contemporary washers and dryers. Stackable units require some additional procedures, for example, the creation of additional power outlets, and of course loading one on the other safely and securely before using them. What about combos? Everything is a breeze. You unpack them, connect them to the nearest outlet and get going. Plus, you may not even need an extra water line – your existing sink is enough. The one trade-off that even the best combination washers & dryers have is that while they do a respectable job, they’re not as efficient and effective as some premium separate washing and dryer machines. However, not all combos are ‘inferior’. Washer dryer combos which use heat pumps are known to be as good as high-end washing and dryer machines. The other noteworthy issue is that non-condensing ventless machines may cause humidity problems, especially when mounted in very tiny spaces. Many users are unsure about washer dryer combos and other close washer-dryer configurations including the stackable washing-drying appliances and laundry centers. As opposed to other configurations, a washer-dryer combo comes as a single machine which can wash and dry your clothes. As I mentioned earlier, a combo uses the front-loading design and it’s as big as a typical stand-alone washing machine. These come as two separate machines – a washer plus a dryer, which are stacked one on top of the other. Stackable machines are the best choice for bigger families with extensive cleaning needs which may require the well-rounded functionality and capacity of both a washer and a dryer without sacrificing too much space. Lastly, stackable machines use the top-loading design making it easier for the user to access the dryer and washer as needed when stacked. To put it simply, these are a perfect compromise between combos and stackable configurations and bring the best of both worlds. Just like stackable units, they comprise of two separate machines- the washer and a dryer. Ideally, combo washer dryers should be vented, similar to standard dryers. Venting prevents unpleasant side effects including growth of mold and mildew caused by excess moisture. However, most washer-dryer combos are ventless because it’s not always that you are able to build a vent in constrained spaces. While this helps to achieve the key goal of economizing on space, it makes clothes to take longer to dry – a common complaint by users of combo units. So, who should buy an all in one washer dryer? The answer is simple: Space, my friend! If space comes at a premium wherever you live, hang-drying your clothes can never be an option so the jack-of-all-trades is probably your easiest way out. Any machine classified ‘A’ going up is great. Otherwise, if you pick one that’s lower, arm yourself because you will soon be receiving huge electricity bills. Also, high energy consumption does not do our environment any good. As much as we’re talking about everything else, you also need to be practical. So, how much washing do you do on average? If you are the family laundry champion, I expect that you will have lots of clothes to go through. On the contrary, if it’s just you, a smaller machine will be adequate since you just have a handful of washing to handle. Although all in one washer dryers are slower than the stackables and laundry centers, some still try hard to do a quicker job. So, look out for models which complete cleaning and drying within the minimum expected time. Also, note that an express wash setting is usually faster than the usual standard settings. Some washer dryer combos have a larger endowment of features and offer much more when handling different laundry tasks. Extras like a moisture sensor, which protect your garments from getting ruthlessly scorched, are handy. Another plus is the ability to remove allergens and kill bacteria. You definitely need to be double sure that it’s going to fit in the designated laundry space. And it’s a simple affair if you ask me. Take out your tape measure and keenly measure the size of the space you’ve set aside for your combo – to the next millimeter. As you do so, leave around 3 inches out to cater for wires and the pipes on either side. Once the precise measurements are at hand, now look at the dimensions of what’s on offer. It’s no secret that the pricier the model, the more customizing options you enjoy. Check the number of wash programmes, quick washes, energy star rating, Wi-Fi compatibility, digital/LED displays, and economy settings it comes with. Hand wash Imitates hand washing and is great when washing delicates. Sanitation cycle Activates allergens and bacteria removal during a cleaning cycle. Temperature settings Adjusts water temperature (hot or cold) as it flows into the machine. Stain removal Enhances chances of eliminating stains. Half load cycle Reduces water consumption especially for those who always run both the wash and dry cycle with every load. Reverse tumbling Forces the drum to keep changing its spin direction when drying. This gives better results while ensuring that clothes do not tangle. Noise dampening Silences annoying noises and is common in the more expensive machines. Extended tumbling Ensures that the cycle runs for extra tumbles in order to discourage excess wrinkling in your clothes, making your ironing work easier. Moisture sensor Measures the dampness in your load, and adjusts the drying time as needed. Therefore, your clothes are protected from being scorched. Since they made their first appearance around the scene a couple of years back, washers’ technology has grown in leap and bounds. Today, the market is teeming with washers which are rated as highly energy efficient. On the other hand, dryer technology has remained stagnant. Overall, this means that certain combo units are more energy-efficient compared to users of two standalone standard machines. Even better, you can act smart and end up saving even more bucks from your utility bills – even with the models which are not yet energy-star certified. It’s about savings, right? So, why should you run two separate cycles when you could fit and clean everything at once by taking advantage of your machines big drum? During a hot water wash, try to turn down the temperature if your machine allows. By doing this, you reduce the energy needed to heat the water. By pre-soaking your clothes in warm water, you reduce the amount of work to be done by the unit, potentially leading to more energy savings. In most places, utility companies charge more per unit of energy consumed during peak-hours. So, if your unit has a timer, set it to power on in the off-peak hours (early morning and during the night). This will boost your efforts to save energy. A dryer’s sheet residue can gunk up the moisture sensor. So, clean it occasionally to continue enjoying savings. Before every load, clean the lint filter. This ensures an improved air flow, so that the unit dries fabrics effectively. If the dryer is drawing in cool air, it will need more energy to heat the air up. Therefore, avoid installing your combo in cold basements by all means. Q: Why does my combo machine continue to spin yet the remaining time is not changing? A: This is caused by a load imbalance in the combo’s drum. To correct this situation, stop your machine and re-arrange your garments. Once you restart it, the problem will be gone. Q: Does it mean that it’s too humid if I can feel an electric shock? A: Now, you’ll always feel a weak electric shock when the surrounding is humid. To be safe, let your machine dry after use. Also, consider wiping the plug dry using a towel. Q: Why does it fail to start? A: This is often due to the combo’s door not being properly shut. In most cases, opening and closing your washer dryer machine’s door solves the problem. If not, the sensor/pressure pad which senses when door is shut may be faulty. You can also try wiping the entire door and the surrounding latch with a clean towel or cloth before trying again. Q: Why does the door refuse to open at the end of a cycle? A: If the machine is unable to drain, the door will not open. This is how the machines protect themselves against water-induced damage. Unknown to you, the water could even be hiding in the pipes. To clear the mess, turn the machine to a spin cycle to forcefully drain water. In the event that you don’t succeed, try draining it manually. Q: What do I do when the automatic switchover doesn’t work? A: Your washer-dryer combo may fail to switch on the dryer at the end of the washing cycle even after setting it to automatically do so. The cause is residual water in either the drum or accompanying waste pipes. You, therefore, have to try and flush it out either by running a new cycle then restarting the dryer or manually draining. We are coming to the end of our in-depth best washer dryer combo reviews and buyer’s guide. Well, I think you agree with me that washer-dryer combos are no doubt viable laundry options for those living in compact spaces. Also, those needing a practical solution for washing and drying clothes have an easy solution. Their strength lies in their petite sizes which help you save precious room space and their portability which lets you use it almost anywhere. They may not be as good as the full blown washing and drying machines. Nevertheless, they help you remain neat and smart despite living in areas where it’s impractical to hand-dry clothes. And as we have seen, some of them offer massive customization options enabling you to get the best results for your outfits. That’s all, for now, about these convenient home appliances. If you believe there’s a model we have left out, please leave a comment and we will be happy to review it.